The winter has come sooner than expected so my time to properly prepare has been cut down to well zero days. I know I’m exaggerating but had you seen my lips last week you would have said the same. They looked like winter lips and not like fall-lips. If there even is such a thing?! Either way my lips were so dry that lip balm didn’t work properly anymore either. Licking my lips just made sure that not only my lips were dehydrated but I generally was too. 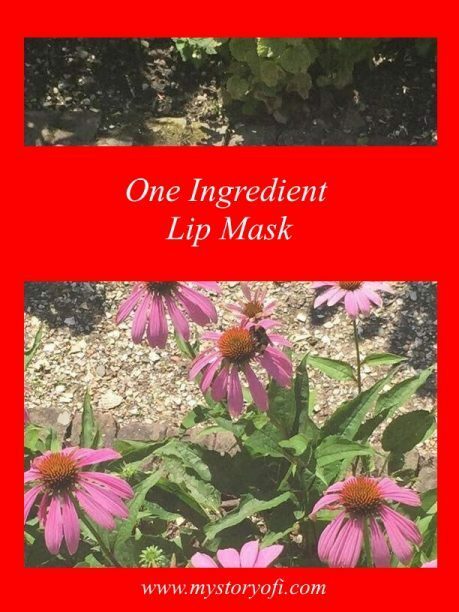 In other words high time to treat those lips to a wonderful one ingredient lip mask! In that same swoop inject some much needed downtime for me. You know treat yourself! As you know I’m all for hitting the kitchen for a DIY masks. In the kitchen there are a multitude of products that can be used to re-hydrate your lips. However there is one product who can do the trick without much fuss. There is only one problem with this product. Well actually it is a problem for the group of people that have a sweet tooth because licking it of your lips is very tempting as it tastes very nice. The one ingredient that makes up this lip mask is honey. Such a simple product, yet so very useful. Having a garden like this will definitely attract some bees! Photo taken in Punta Cana, Dominican Republic. This is the simplest lip mask ever to be used I think. Just scoop a little honey on the back of your spoon make sure it is enough to cover your lips. I first dab the honey directly from the teaspoon on my lips and then smooth it out making sure my lips are fully covered. Sometimes cover a little bit around my mouth as well, just for extra coverage. TADA! Lip mask done. Leave it on to work its magic for about 20 minutes in which you can treat yourself further. I decided to sit down and use my time to catch up on my reading. There were several chapters of a book I wished to reread so those 20 minutes were perfect. After the 20 minutes you can either wash it off or lick it off. The choice is really yours! I personally leave the honey on overnight, just for it to really coat my lips nicely. If you’re going to leave it overnight make sure you put the honey on 20-30 minutes prior to going to bed for you not to smudge it all over your pillow. Check whether the majority of it has worked it magic, before going to bed. Really, the likelihood of you regretting not doing that is high! The next morning, after washing the residue off, I but on some coconut oil and my lips were back to their lovely hydrated form. My lips are now well protected against the ever changing weather and I’m caught up on my reading. Another lovely treat yourself, if you ask me. Somethings in life just don’t have to be complicated.